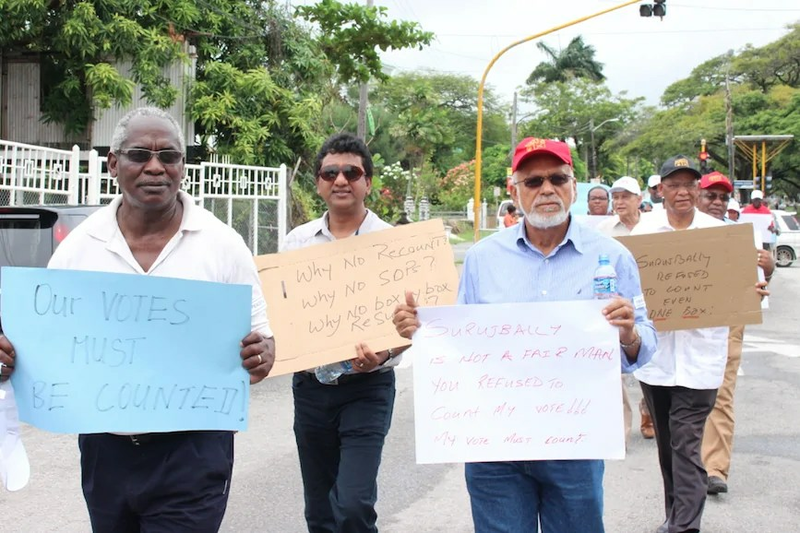 Former President Donald Ramotar and a number of his former Ministers and candidates of the opposition People's Progressive Party protested for just over an hour outside the Kingston head office of the Guyana Elections Commission demanding a recount of all the votes cast. 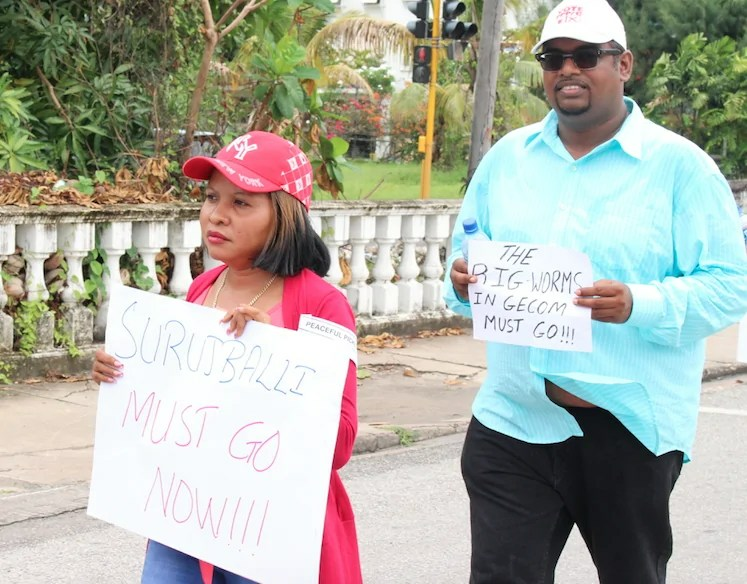 Members of the former government and their supporters found themselves on the picket line on Thursday midday as they launched a national protest against the just concluded national elections that ousted them from office. Former President Donald Ramotar and a number of his former Ministers and candidates of the opposition People’s Progressive Party protested for just over an hour outside the Kingston head office of the Guyana Elections Commission demanding a recount of all the votes cast. The PPP is convinced that it won the May 11 elections and believes that a recount of all of the more than 400,000 votes cast would validate its belief. With a placard in his hands and a party cap on his head on a cloudy day, the former President Donald Ramotar told News Source that he has no doubt that he won the elections and was cheated out of government. “I have not lost these elections, these elections were rigged”,Ramotar said. Mr. Ramotar said he has no regrets over his decision to prorogue the parliament and set a date for elections, two years before his term in office would have been completed. He said he is convinced that the alleged “rigging” of the elections took place in GECOM and outside of GECOM. The former President said the Chairman of the Guyana Elections Commission needs to leave office because the PPP had requested the names of all GECOM polling day staff and that was never provided. Mr. Ramotar said it was on elections day that it was realised that many of the polling day staff employed by GECOM were supporters of the APNU+AFC coalition. The Chairman of the Guyana Elections Commission, Dr. Steve Surujbally has brushed aside calls for his resignation and has indicated that he will leave office if and when he sees fit and that time is not now. While the PPP intends to file an elections petition and continue with its protest action, the international community and the observers of the elections have declared that the elections were “free, fair and credible”. On Wednesday, the US State Department issued a statement of its own commending the Guyana Elections Commission for conducting elections that were “free, fair and credible”. Mr. Ramotar believes they were all duped by the elections commission and had very little exposure to “what was actually going on”. The General Secretary of the People’s Progressive Party, Clement Rohee explained to News Source that the protest action is only part of the response to the elections from his party. Mr. Rohee said the PPP intends to move ahead with its elections petition and he also intends to lobby the international community on the issue as the party demands a recount. The protest action brought together just over 100 protesters including members of the former government and some candidates who were no strangers to protest lines. Former APNU Member of Parliament, Africo Selman who switched sides just before the elections, has found herself on the opposition side once again in her very short political journey. 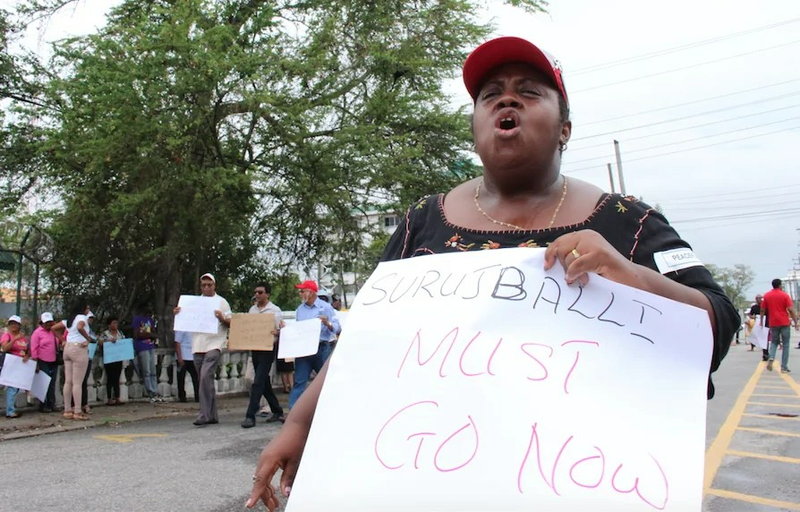 Also part of the protest action in the city today was trade unionist and former PNC supporter Gillian Burton who switched sides heading into the 2011 elections. Attorney-at-Law, Charles Ramson Jr. was busy leading the protest action in chants of “steve it’s time to leave” and “we demand a recount”.